There is a disconnect between the market and a major source of dividend income for investors — MLPs, or Master Limited Partnerships. Master Limited Partnerships are publicly traded companies that enjoys the tax benefits of partnerships. That means most of the company’s cash goes to the partners — in this case, the shareholders. Most MLPs form around giant infrastructure projects like pipelines, oil storage, refining or some other energy industry entity. These are huge, boring projects that act as toll roads in the oil and gas industries. The latest rise in oil prices began in June 2017. The price rose 38% in less than six months. The MLP Index usually mirrors a move that size in the oil price. But it hasn’t yet. 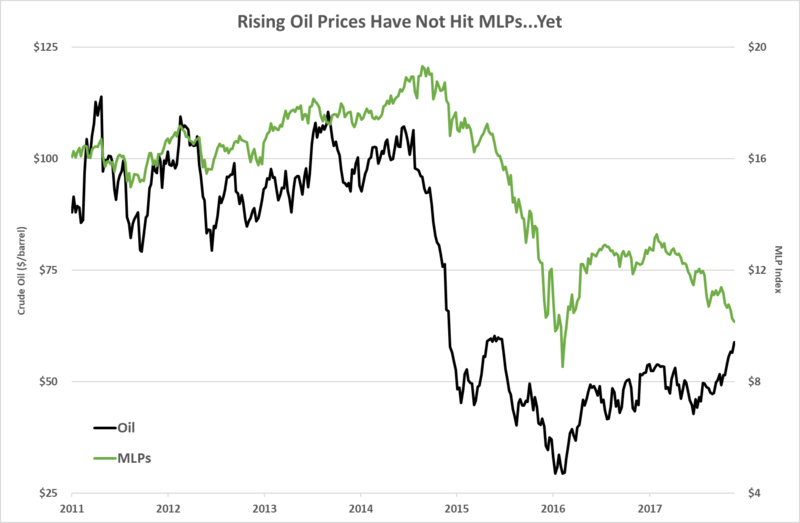 While the oil price is at its highest point since 2015, the MLP Index is at its lowest point in nearly two years. That’s great news for us. Remember, we want to buy sectors when no one else does. The Master Limited Partnership space is too cheap, particularly if oil prices continue to rise. With MLPs, that means we can lock in huge dividend yields. Today there are several large MLP funds: the JPMorgan Alerian MLP Index ETN (NYSE: AMJ), the Alerian MLP ETF (NYSE: AMLP) and the UBS ETRACS Alerian MLP Infrastructure ETF (NYSE: MLPI). These are all giant funds … and they all pay between 7.6% and 8.7% yields today. The rising yields are due to falling share prices. Investors fled these funds due to falling oil prices and rising interest rates. A higher interest rate makes dividend payers like Master Limited Partnerships less attractive. However, historically, these companies didn’t flinch when interest rates rose. So the sell-off in MLPs appears overdone. Today we have rising oil prices that should generate more revenue across the Master Limited Partnership space. That means more cash will go to shareholders … which will increase dividend yields. This looks like a great time to get in while the share prices remain low.